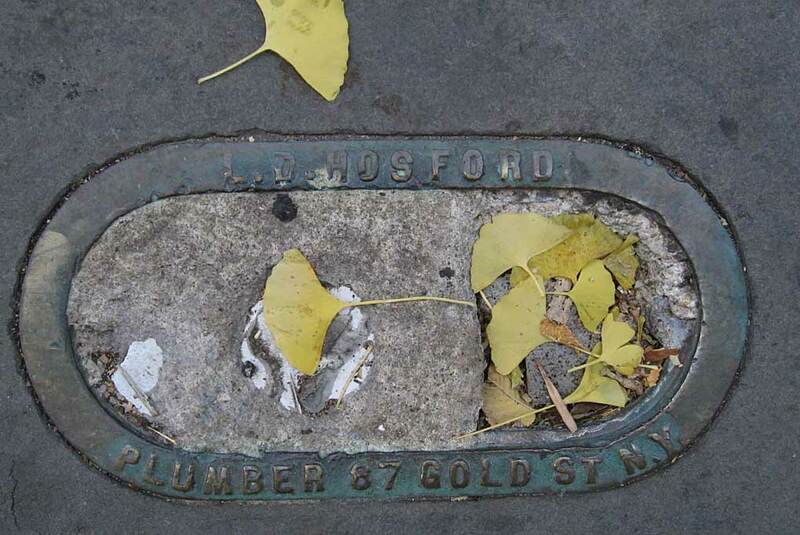 Leonard David Hosford (1862-1918) was a plumber in New York City from 1886 to 1915. The business was located at 67 Gold St. from 1896 to 1899, then moved to 68 Beekman St. where they were located from 1899 to 1908. Various trade journals mention plumbing work undertaken by Hosford, such as the power plant in the Realty Building on Rose St. near the Brooklyn Bridge; the elevator apartment building at 320 W. 26th St.; the YMCA building at 153 E. 86th St.; the Bowling Green Building designed by W. & G. Audsley at 5-11 Broadway (1895-98); and the New York Athletic Club (this was the older location of the New York Athletic Club designed by Wm. A. Cable at 59th St. and 6th Ave. ca.1899). Hosford was also the author of articles about plumbing, for example, "The Defective Application of the Fresh Air Inlet to the House Drain," "Plumbing Fixtures which are Dangerous to Health," "The History of a Private Bath-room in Forty-third Street, New York," and "Toilet-Rooms and Appurtenances for Factory and Warehouse Buildings," all published in Sanitary and Domestic Engineering, 1891. He also contributed to the book, Suburban and Country Homes, published New York, W. T. Comstock, 1893. Leonard D. Hosford secured several patent related to plumbing including "Process of Electroplating Lead Pipes," patent no. 403,429 dated 14 May 1889; "Trap," patent no. 598,992 dated 15 February 1898; and "Gas Burner,"patent no. 341,381 dated 4 May 1886. Hosford died 2 April 1918. The following appeared in the New York Times, 4 April 1918, "Leonard D. Hosford, 56 years old, a retired plumbing contractor for fifty years in business on Beekman Street, Manhattan, died on Tuesday at his home, 1,443 Glenwood Road, Brooklyn, from heart disease." A longer obituary appeared in The Plumbers Trade Journal, Steam and Hot Water Fitters Review, vol. LXIV, no. 8, April 15th, 1918, pg. 494, "Leonard D. Hosford, a retired plumbing contractor of New York City, considered the father of the open plumbing system, died April 2d, of grief over the death of his son, Leonard T. Hosford, who passed away on February 28th last. Mr. Hosford was born in Bantan, Conn., in 1862, and had been a resident of Brooklyn for forty years. For twenty-five years he conducted a large plumbing business in lower Beekman street, Manhattan. He catered to the best trade in the city, and many of 'the four hundred' were to be found on his list of patrons. Among the private residences he had equipped were those of Ex-Governor Murphy, of New Jersey, at Trenton, of Frederick Vanderbilt and of Elihu Root, of South Hampton, L. I. He was one of the plumbers in the introduction of the open plumbing system, and because of the vast amount of research and investigation he made in this field, earned the title of 'the father of the open plumbing system.' He devised many contrivances to ease the tasks of plumbers and had several patents. As an authority on open plumbing he was often consulted by local contractors, and never failed to effect the desired result. He is survived by his widow, Carrie E. Hosford; one son, Dwight, of the Ordnance Corps., Camp Jackson, Columbia, S. C., and two daughters." Another Hosford sidewalk opening, reading Leonard D Hosford / 68 Beekman St NY, is found on 96th St. near Central Park West, next to First Church of Christ, Scientist (Carrère & Hastings, 1899-1903). As noted in The Metal Worker, 8 February 1902, pg. 42, "L. D. Hosford will have a nice job of plumbing to do in the First Scientist Church, at the corner of Central Park West and Ninety-sixth street."